Monsignor John Joseph Sullivan, a native of Tooele, is pictured at a recent celebration to honor his service to the Roman Catholic Church. 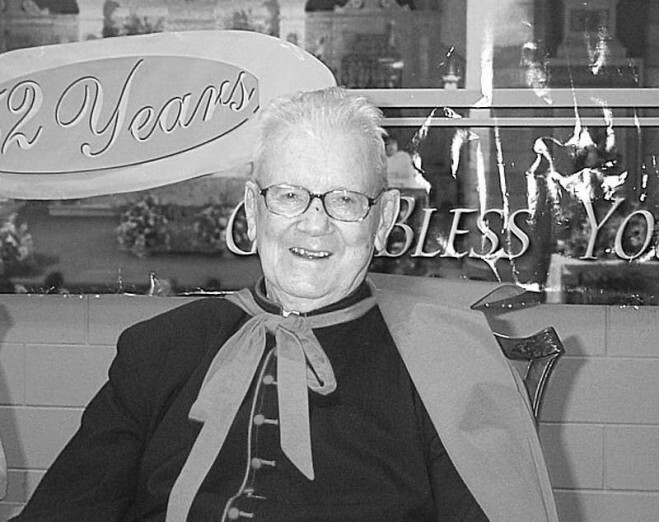 Sullivan, who was proud of his Catholic as well as Irish heritage, passed away on March 17, 2005. He was buried yesterday at the Mount Calvary Catholic Cemetery in Salt Lake City. He held one of the highest ecclesiastical offices in the Roman Catholic Church — but perhaps the most lasting memory Monsignor John Joseph Sullivan left with the residents of his own hometown was that all people — regardless of race, religion, education or socio-economic standing — should work together for a mutual feeling of love, peace and understanding. Born May 28, 1926, Sullivan attended Tooele Central and Junior High schools. He left Tooele at the end of his sophomore year to attend Saint Joseph’s College in Mountain View, Calif. At that time, Saint Joseph’s was a minor seminary which included four years of high school and two years of college level training. Sullivan later attended St. Patrick’s Seminary in Menlo Park, Calif. He was ordained a priest in the Cathedral of the Madeleine on May 13, 1951. During his youth, Sullivan worked as a paper boy for the Tooele Transcript-Bulletin. He also worked as a water boy on a construction crew at Tooele Army Depot. 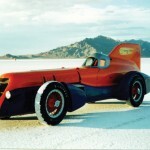 And while he was attending seminary in California, Sullivan would return to Tooele each summer to work on a track gang at the Tooele Smelter. Before coming back in 1970 to serve as leader of Saint Marguerite’s Parish, Sullivan served as pastor at Saint Olaf Parish in Bountiful, Bingham Canyon and Copperton, and at Saint Patrick’s in Salt Lake City. Peggy Abbot Martinez served as secretary at Tooele’s Saint Marguerite’s Parish for 24 years. She said the seven years she worked with Monsignor Sullivan are among her fondest memories. And in fact, Peggy’s parents, Joseph and Catherine Abbot, were Sullivan’s godparents. Martinez remembers the day that Monsignor Sullivan attended an assembly at Tooele High School and stood up and told the students, “We want justice for everyone.” She said those in the auditorium that day responded to Sullivan’s words by giving him a standing ovation. Father Wixted said, “Monsignor Sullivan was sensitive to the needs of the underprivileged and the Hispanics. Were it not for the efforts of Monsignor Sullivan, Martinez says the beautiful chapel that houses Saint Marguerite’s Parish would not have been built. “He worked tirelessly to raise funds for this church,” Peggy said. But along with Peggy, Bennie Mascarenas, another member of Saint Marguerite’s Parish, remembers that Monsignor Sullivan might have been “somewhat mischievous” during his youth. Father Wixted laughed heartily at Mascarenas’ story and added that he, too, had heard about some of the “less serious” times Monsignor Sullivan had as a youngster. “That probably helped him to better understand the human condition of vigorous youth,” Father Wixted said. Then, in a more serious tone, Father Wixted said working with Monsignor Sullivan “was wonderful. Father Wixted also spoke of the great pride Sullivan took in his Catholic as well as Irish heritage. Ironically, Monsignor Sullivan passed away on March 17, 2005. Martinez remembers that Sullivan always took the time to visit the homes of his parish members. And last summer, when a tragic car accident claimed the lives of four young Tooele residents and injured six others — all members of Saint Marguerite’s Parish — Monsignor Sullivan came to Tooele the following morning. Martinez’s two grandsons, Brooks and Eric Martinez, were among the four youth who died in last summer’s crash. At the Diocesan level, Monsignor Sullivan served as a consulter to two bishops and on numerous committees. He was named a Prelate of Honor in January 1988, and a Protonotary Apostolic in April 2001 by Pope John Paul II in recognition of his years of faithful devotion to the works of the Catholic Church. He was a member of the Equestrian Order of the Holy Sepulcher of Jerusalem. Father Wixted said that Monsignor Sullivan had been ill for a couple of years before his death last week. A Funeral Mass was held Wednesday at the Cathedral of the Madeleine for Sullivan. He was buried at Mount Calvary Catholic Cemetery in Salt Lake City.